The ship disappeared from the shipping registers in 1933 and was probably scrapped in Italy about that time. Propulsion: Two 1,500ihp engines, two shafts. 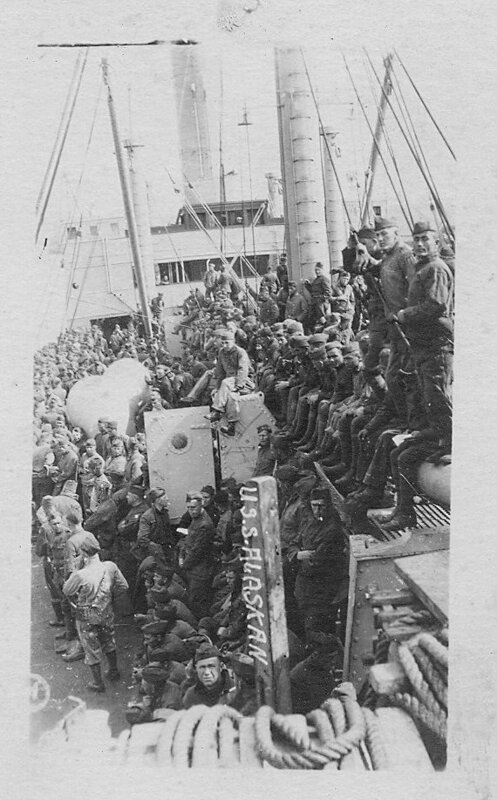 104k At St. Nazaire, France, loaded with homeward bound troops, 3 July 1919. The original photograph is printed on postal card ("AZO") stock. It is inscribed "Uncle Charles came home on this boat", and also contains a message, dated 15 March 1921, from Fern L. Mason to Frank H. Mason. 77k Arriving in a U.S. port (probably New York) in 1919, with her decks crowded with troops returning from Europe. Photographed by J.W. Allison, New York City. Dictionary of American Naval Fighting Ships: Alaskan—a twin-screw steel-hulled cargo ship—was launched in 1902 at San Francisco, Calif., by the Union Iron Works. Built for the American-Hawaiian Steamship Line, for the New York" to-San Francisco-to-Honolulu trade, Alaskan and her sister ship, Arizonan, represented according to a contemporary account the "most advanced practice in the construction of ocean-going freighters and . . . a most important addition to the Americas merchant marine." Intended exclusively for freight-carrying. Alaskan was designed as a very strong vessel with large stowage capacity. Such a desireable vessel naturally came under the scrutiny of the Navy as it expanded to cope with its mission during World War I. Inspected in the 3d Naval District on 23 May 1917 Alaskan was assigned the identification number (Id. No.) 4542 but not taken over by the Navy for several more months. On 12 March 1918, a despatch indicates that the Shipping Board would turn the ship over to the War Department as a cargo carrier to be manned and operated by the Naval Overseas Transportation Service (NOTS) for the Army on a bare ship basis. She was taken over on that same day and commissioned on 23 March 1918 at Morse's Dry Dock, Brooklyn, N.Y., Lt. Comdr. Walter P. Hillman, USNRF, in command. 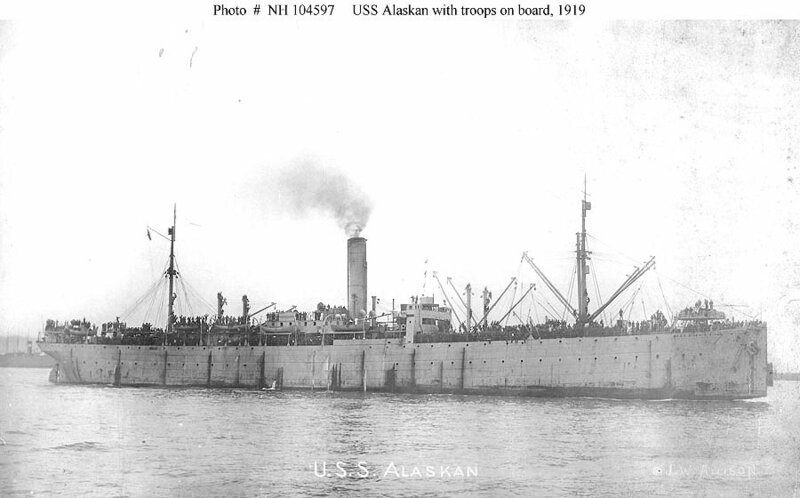 Alaskan sailed for Hampton Roads, Va., on the afternoon of 24 March 1918. Anchoring in Hampton Roads in the predawn darkness of the 26th, she moved shortly thereafter to the Norfolk and Western Piers, docking at 1228. 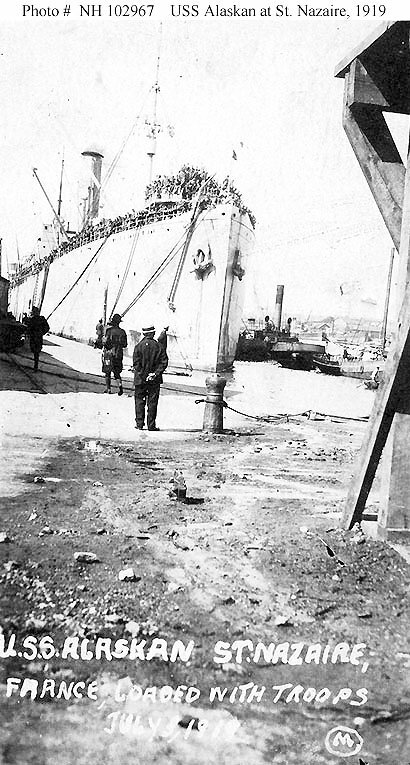 Over the ensuing days, the cargo ship received more men and underwent needed repairs. Yard work completed and complement brought up to full allowance, the ship shifted to Pier 5, U. S. Army Piers, Newport News, to take on cargo on 13 April. Three days later, she proceedcd to sea and joined a France-bound convoy on the 17th. She reached Brest on the afternoon of 2 May, before weighing anchor early the next morning to proceed in a coastal convoy to St. Nazaire. En route, one of the ships in the convoy, the American SS Pearl F., attempted to cut between columns, veering across Alaskan's bow. The accident resulted in Alaskan's stem being badly twisted to starboard, and plates attached thereto either broken off or cracked, but she was still able to complete the voyage, anchoring at St. Nazaire that evening. However, due to crowded harbor conditions, she did not begin discharging cargo until 6 May. A week later, lookouts spotted a fire breaking out on board Mexican (Id. No. 1655), lying directly ahead of them in St. Nazaire harbor. Alaskan called away her fire and rescue party which aided Mexican's men in controlling the blaze before it did serious damage. Alaskan remained in French waters into June, first at St. Nazaire, completing the discharge of her cargo, before she proceeded down the coast, passing the Ile de Yeu on 7 June in a coastal convoy bound for the Gironde River, which she reached later that day. Getting underway on the 10th for the return voyage to the United States, the ship brought her first voyage for NOTS to a close when she reached New York harbor late on the 23rd. Her second wartime voyage began on 28 July, after the ship had undergone voyage repairs at Morse Drydock, Brooklyn, before moving to Bush Terminal Pier No.6 to take on cargo. Carrying the vice commodore of the convoy, Lt. Comdr. Isaiah F. Shurtleff, USNRF, Alaskan arrived at St. Nazaire on 12 August, anchoring late the following day. Among the cargo she discharged was oil for the tanks at the United States Naval Aviation Station, Le Croisic. With a return cargo that included ordnance material, the freighter got underway for home on the afternoon of 28 August and reached Hampton Roads on the afternoon of 13 September. For her third voyage during the war, Alaskan cleared Hampton Roads on 29 September and joined a France-bound convoy the following day, this time routed via Gibralter. Arriving at the British colony on the 16th of October, Alaskan lingered there until the 20th, when she began the last passage of her voyage. Two days out, at 1137 on 22 October, she collided with, and sank, a fishing boat (nationality not specified in the logs). Fortunately, another boat "of similar character" fished the men out of the sea. Reaching Marseille a little before midnight on 23 October, Alaskan discharged lumber, tractors, and trailers, on the 26th and over ensuing days. The cargo ship was still lying in port on 11 November when the news reached her of the signing of the armistice with Germany-an event duly celebrated by the ship's sounding her whistle and hoisting allied flags. 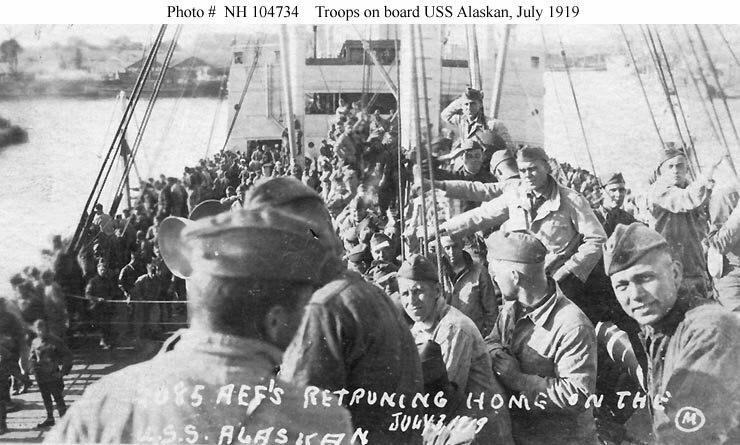 Alaskan ultimately reached Newport News, via Gibraltar, on the afternoon of 29 November 1918, bringing to a close her third and final round-trip voyage under the aegis of NOTS. Now that the war was over "over there," the return of troops became a priority item. Alaskan was selected for conversion to a transport to aid in the World War I version of the "Magic Carpet" operations from another global conflict more than two and one-half decades later, and assigned to the Cruiser-Transport Force on 12 December 1918. Two days before the reassignment, Alaskan had sailed for New York, where her guns were ultimately removed by a Navy derrick lighter off Weehawken on 19 December. Over the following weeks, Alaskan underwent a metamorphosis from cargmnan to trooper, with the addition of troop accommodations for up to 2260 men. The work was done at Brooklyn by the W. A. Fletcher Shipyard under the direction of Army authorities. Unfortunately, as will be seen, the initial estimates of her troop carrying capacity were much too high. 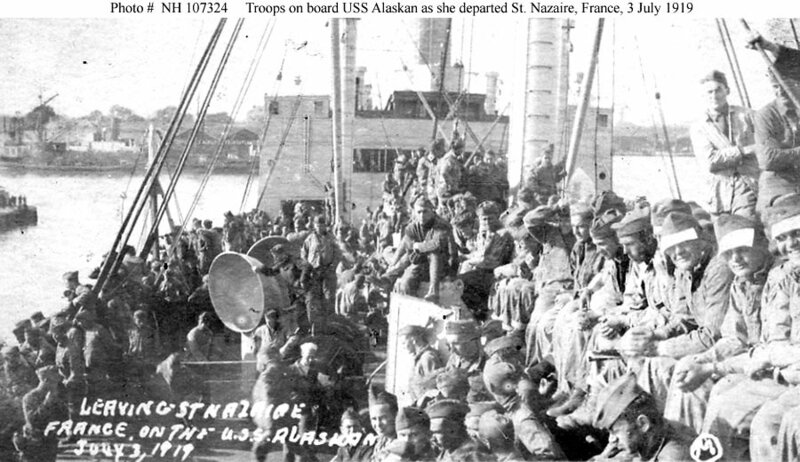 Alaskan--now a troop transport-cleared New York harbor on 24 February 1919, bound for France, and reached St. Nazaire on 10 March. After embarking troops between 0910 and 1710, on 15 March, she got underway later the same day on the return leg of the voyage. Alaskan moored at Army Pier No.2, Hoboken, on 31 March, and after quick voyage repairs, sailed again for European waters on 7 April. She conducted three more trooping voyages, one to Bordeaux and two to St. Nazaire, each time returning to disembark returning doughboys at Hoboken. She sent her last contingents of troops ashore alongside Pier No.8, Hoboken on the afternoon of 16 July 1919. After drydocking at Brooklyn, and the removal of her troop accommodations, Alaskan was back at Pier No.8, Hoboken, by 24 July. 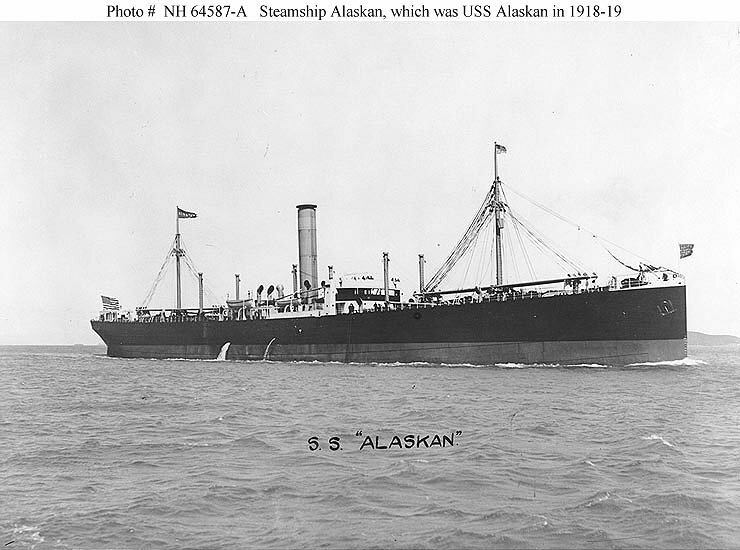 On 5 August, at 1602, Alaskan was turned over to her prewar owners, the American-Hawaiian Steamship Co.
Alaskan operated under the house flag of the American- Hawaiian Steamship Co., for the rest of her time under the stars and stripes, through the mid-1920's. Sold to Italian interests in 1927, she became Memore, and was registered by the Companie Generale Armamento Soc. Anon., her home port being listed as Genoa. She remained on contemporary merchant vessel lists until 1938, and then her name disappeared from the rolls. Presumably, she was scrapped in Italy in the early 1930's.